Enjoy the grace and elegance of harp music on your wedding day. The music which accompanies the bride down the aisle is one of the most important details of your wedding day. Only an experienced musician can ensure the appropriate timing. Having played for over a thousand weddings, Adrienne has this experience. Her extensive performances at wedding ceremonies and receptions allows her the ability to create beautiful and lasting memories for your wedding day. Adrienne particularly enjoys the creative process of putting together the musical selections for wedding cermonies. She has helped countless couples choose music for their special day, including those who had no idea where to begin. She has an extremely varied and versatile repertoire. 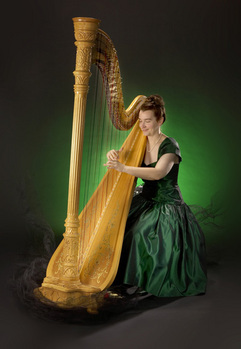 Her elegant harp music will add a touch of beauty and class to your wedding day. Adrienne has worked extensively with Calgary's Marriage Commisioners allowing for a seamless flow to your wedding service. Additionally, she is well versed in the customs and tradtitions of non-denominational and traditional church services including Catholic, Protestant, Lutheran, Greek Orthodx, Anglican and other religious denominations. If you are not planning a traditional wedding, Adrienne also accomodates celtic, medieval or other themed weddings. This is soft background music played while the guests are being seated. It sets the mood for both beauty and the solemnity of the service. The processional music is played when the bride and her bridesmaids walk down the aisle. If the bridal party is large you may opt to have two songs; one for the bridesmaids and a separate one for the bride. Some recommended wedding processionals include Canon in D, Jesu, Joy of Man’s Desiring and the traditional Here Comes the Bride. Pleasant background music is played while the bride and groom sign the marriage documents. There are many options available, but something soft and inspiring is usually most appropriate. Recessional music is played at the completion of the ceremony as the bride and groom along with the wedding party leave the church. It is usually upbeat and celebratory. A few suggestions include the Wedding March by Mendelssohn, Trumpet Voluntary by Purcell and Ode to Joy by Beethoven. Adrienne is happy to take your musical requests and incorporate them into your ceremony. Let Adrienne help you to create the musical mood for your wedding day.